Tue., July 31, 2018, 11:42 a.m.
A Pasco murder suspect has been moved to the Washington State Penitentiary pending his trial after he allegedly assaulted corrections officers in the Franklin County jail. Pedro Cadenas, 18, has five felony charges stemming from two jail incidents in May. Those are on top of the three charges he already had, including first-degree murder for shooting a man in the face last summer. Both Franklin County Superior Court cases have been on hold since late June, when defense attorneys requested a mental health evaluation for the Pasco teen. At the same time, state Department of Corrections officials agreed to house Cadenas in the Walla Walla prison pending his other cases because he allegedly was causing too many problems in the county facility. The mental exam is being done in the prison. An update is planned Aug. 7. State corrections officers will transport him from Walla Walla to court in Pasco. Trial dates will be set if and when a judge finds him competent to proceed. Rodriguez, 51, was on his way to the grocery store before heading home late on July 4, 2017. At some point, Cadenas got into the passenger seat of Rodriguez’s Cadillac Escalade and shot him, said police. The SUV left Lewis Street and crashed through a fence and into a parked car. Rodriguez, bleeding from his face, got the attention of passers-by to call for help. Cadenas allegedly tried to drive off in the Cadillac but had to abandon those efforts because the gas tank was stuck on a fence post. Cadenas returned to a holiday barbecue and, when asked by an ex-girlfriend if he shot someone, replied, “I had to do it,” documents said. He was arrested two days later. Rodriguez, who was a father of three and soon-to-be grandfather, was in a coma in a Spokane hospital after the bullet damaged his brain. He died 3 1/2 weeks later on July 29. Cadenas is charged with first-degree murder, drive-by shooting and second-degree unlawful gun possession. He automatically was charged as an adult given the gravity of the allegations and the fact he was just five months shy of his 18th birthday. The newer case involves three counts of custodial assault and two counts of second-degree malicious mischief. 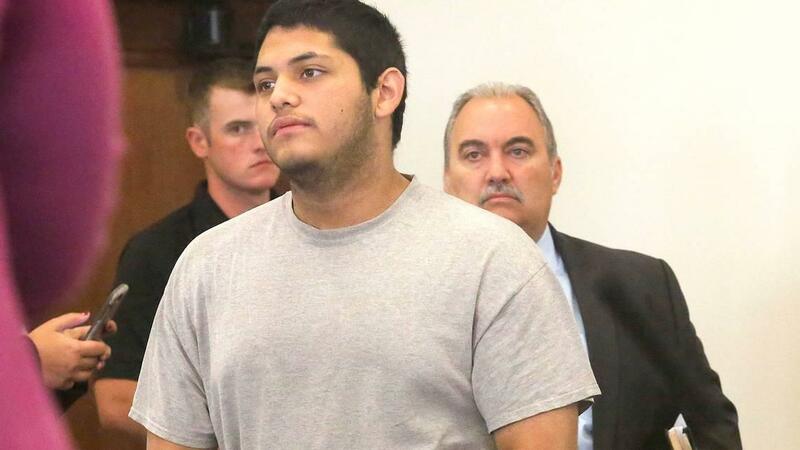 In the first incident, corrections officers Kyle Dallas and Daniel Vergara on May 9 noticed a large amount of water coming out of Cadenas’ cell and found the fire sprinkler head had been broken, court documents said. Cadenas, the only inmate in that cell, was covered in dirty water and asked to take a shower. He spit on Dallas and Vergara, documents said. Then at 1:41 a.m. May 24, Cadenas was in a holding cell when he asked for water. Corrections officer Mayra Romero filled up Cadenas’ cup through an opening in the cell door. When he asked for more, Cadenas threw the full cup at Romero and cussed at her, documents said. Romero was not hurt but was concerned about blood-borne pathogen exposure. When asked for his side of what happened, Cadenas just inquired about what charges he was facing and then refused to talk further, said court documents. His bail is $750,000 on the murder case, and $5,000 for the custodial assaults. Published: July 31, 2018, 11:42 a.m.